Lately I've been working on the constructing the Waterfall Christening Gown, so here is a quick update on my progress. This photo shows the sleeve gathered and attached to the gown with entredeux. I had rolled and whipped the armscye, then whipped the entredeux to it after trimming the fabric from only one side of the entredeux. That's very important, as I will use the fabric on the other side. As you can see in this photo, I'm using the fabric on the uncut side of the entredeux to fold over the sleeve seam allowance and hem it into place. This is fairly fine, delicate work, but not nearly as exacting and fiddly as goldwork embroidery. So I can get quite a lot done in the car while my carpooler is driving. Both sleeves are finished, and the side seams come next. The dress is looking a bit sad and grubby from all the handling, but I promise it will look just great when washed and ironed. If you would like to follow along on the construction of this gown, just click here. We are driving to Pasadena today, so I expect to get some work done en route. Sometimes inspiration is all around us, even in the most mundane things. A lemon and some asparagus from garden (my garden, by the way!) don't seem like much, but you would be surprised at what a talented embroiderer can do with this subject. Back in Inspirations No. 63, Susan O'Connor found her inspiration in just these lovely lemon and asparagus spears. The project is named Harvest, and also includes the cherries on the right hand page. Cherries won't be in season for another month yet, so I don't have photos. Besides, I don't have a cherry tree, being in Southern California by the ocean where they don't grow very well. Maybe some day I'll try this project. after all, it calls for DMC floss, and I do have every single color. I have three citrus trees: a lemon, a lime, and a blood orange in my courtyard, and right now the fragrance is heavenly as they are all in bloom. Do you get inspiration from the garden? The Persian Peony Tile is finally finished! I got up early this morning to work the final parts of the buds and before I knew it I was done. I did want to take it out in the sunlight and photograph the goldwork, but the weather isn't cooperating. In fact, it's supposed to rain, but so far not a drop has fallen. I love the big peony with the huge bead in the center. It really gives a focal point to the piece. The rich colors are just stunning, especially next to the gold. I also love all the beads. I'm one of those people who think that adding beads to embroidery can only improve it. Of course, when we look at our own work, we are always so critical. Now that I look at it, I should have reworked the detached petal on the left bud as it is shaped a little differently. But I don't think I will. One of my favorite parts of this is wrapping the pearl purl in the purple thread (or any color, for that matter). The purple and gold combination gives added interest to the border. This piece is a combination of gold work, silk embroidery, bead work and stump work. The beads and stump work are very understated, but added in just the right amounts, in my opinion. As I've mentioned in an earlier post, I had problems with the technique our teacher, Jane Nicholas, used for the peony flower and buds. She recommends stitching the padding, whether straight stitch padding or felt pieces, then outlining the pieces in gold before finishing the embroidery. I followed this method for the peony flower, but decided to add the gold last for the buds. At least for me, this seemed to damage the gold much less that trying to embroider around it. I seemed to be always sticking the needle into the gold thread. I also had a problem right in the beginning with putting the work into a hoop. First of all, the fabric was just a bit small for my hoop so I stitched strips of muslin to the sides. This gave some more room to pull on the fabric and get it good and tight in the hoop. But when I got home from the class, I took it out of the hoop and placed it in an Evertite frame. This worked wonderfully and I heartily recommend a frame for all of this type of embroidery in the future. This piece is taken from Jane's latest book, Stumpwork & Goldwork Embroidery, inspired by Turkish, Syrian & Persian Tiles. It's an absolutely beautiful book and I recommend it for the projects and the inspiration it gives. If you like to see more of this book, please read Mary Corbet's review. What is really nice is that there is enough leftover materials from the kit to make one of the small rosettes in the book. I even have an extra of the big red bead in the peony flower. If you would like to follow all the posts on the Persian Peony Tile, just click here. So what is next on the embroidery horizon? Goodness, I have so many things going. First of all, I'll frame up the Golden Pomegranate and try to get that finished, then see what to do next. Maybe some crewel work. Today's post is about a very simple form of embroidery that is especially suited for baby items on fairly sheer fabrics. I mentioned in an earlier post that I was making a bib for a friend to bring to a baby shower. 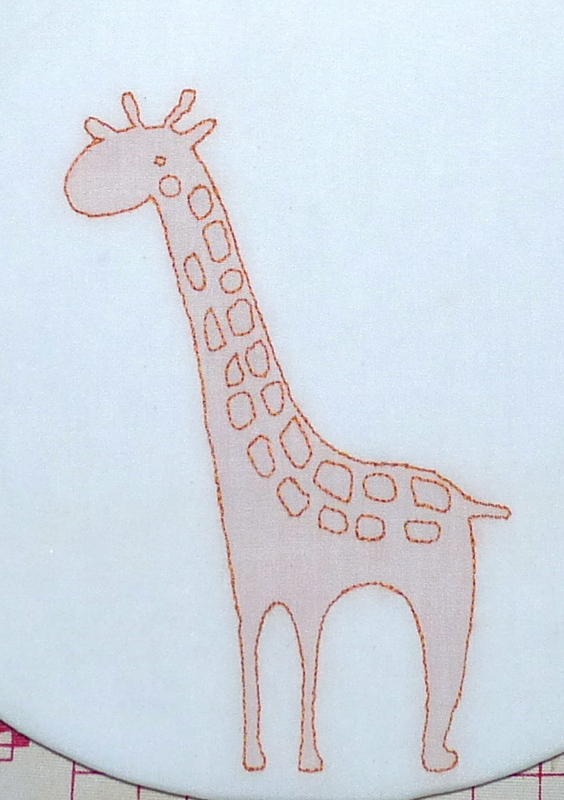 Here is the finished giraffe, nicely shadowed within the outline. As I mentioned before this is a closed herringbone stitch, which can be worked either from the front or the back of the right side of the fabric. I prefer working it from the right side so I can better place the stitches. The front outline looks just like a back stitch. I worked all the inside markings first, and as the giraffe is all one color it's pretty easy. Speaking of color, I actually agonized over which to use. I looked at cartoon images, and worried about how to get the light tan and dark tan of real giraffes into the embroidery. Finally I gave up and just picked this one color, DMC 3853. After all, it's a baby bib! It doesn't need to be realistic. Shadow work doesn't just have to be for babies. This is a name tag we made during our SAGA chapter's meeting as the program offering. Our local chapter, well one of them anyway as I belong to two, goes by the name of Sandcastle and we all have these cute name tags now to wear in our convention badge holders. If you click on this link and go all the way to the bottom of the page, you'll see a another link to download the pattern for the badge holder. If you look closely right under the top of the castle, you'll see the transition between the pink and the orange colors. We stitched the orange first, then the two sides and the middle part of the pink so as not to mix the pink and orange on the back of the piece. With the flag we stitched the "Sandcastle" first in back stitch using green, then the blue shadow work for the body of the flag. We also had some darling seashell fabric for the badge holder, but I had already made one as you can see in this post. Final shot of the bib before it goes to a new mom for her darling little boy. This was constructed using a pattern I had made myself, and has a layer of batting in the middle to soak up drool, milk, water, juice and whatever else a baby can throw at it. As I mentioned in the previous post, this is made of polycotton and can be tossed into the wash. No special handling instructions or ironing required. PS. I have another bit of shadow work in the Toile Eyelet Dress I posted on in June of 2010. The little bluebirds on the overlay are done in shadow work. I didn't label it as such and didn't even mention it in the post, but I will add the label just in case anyone wants to refer to it. First of all, thanks to all of you who commented on my Completed Bud Post of the Persian Peony Tile. It was a difficult decision to redo the bud and to differ from the teacher's instructions, but it did turn out fairly decently so I'm glad I made the switch. After all that agonizing I decided to take a little break before forging on with the two remaining buds. I promised some time ago to show you how to precisely stitch the knapweed petals so that's what I'll do today. I thought I explained how we transferred the design onto the silk, but I can't find it in my posts, so I'll explain it again: I traced the design onto a piece of transfer paper using a soft pencil, then turned the tracing paper so the lead faced the silk, pinned the paper to the silk, and rubbed the design onto the silk using a manicure stick. It worked wonderfully well! However, I did not trace the dots that showed where to stitch the knapweed petals, as the thread used for stitching the petals wouldn't cover the markings. When I was ready to stitch the knapweed petals, I took the tracing paper, which I had carefully saved, and placed it over the design that came with our kits. I then marked dots where the petals would be placed around the knapweed base. The photo above shows the wax paper outline placed over the embroidery. I placed No. 10 embroidery needles through the paper and into the underlying fabric to mark the position of the stitches. You can see the holes on the tracing paper from the flower that I worked in class on the left. After carefully lifting off the tracing paper, I was left with needles sticking into the fabric. Notice the hole? It's just large enough to see to bring the needle with the purple thread through. By the way, the thread is Cifonda Art Silk No 754, which is the most beautiful shade of purple I've ever seen! I just love the color. After stitching the nine petals marked by the needles, I then stitched a petal in between each of the first round of petals. Then, after that was finished, I stitched another petal in between the existing petals but about 1 mm longer, to give an impression of "fluff" to the flower. Finally, I stitched a couple of short petals on either side of the outermost petals, pointing a bit downwards towards the base. And here is the piece with all of the petals finished. All that's left to do are the two buds on each side and then the whole piece is complete. I've been working very hard on the peony buds of the Persian Peony Tile these past few days. After removing all of the embroidery and the felt padding I've already applied, I cut out all new pads and attached them to all three buds. Here is the top bud with the felt padding on the two lower buds completely covered and the top three petals stitched. I'm using Au Ver a Soie, Soie d'Alger in 2934, medium crimson, while the two lower petals are in 2935, dark crimson. The No. 6 smooth passing thread was then couched with nylon thread. In this case, I used one piece for the two lower petals and another piece for the three upper petals. The loops in the middle are a bit wonky, but don't worry, they will be covered up by the detached petal. A completed bud with the detached petal added. At the base of the petal there are lots of threads that got plunged to the back, four of gold and two of the wire from working the detached petal, so the join doesn't look too good. But it will be covered up with green thread. The top three petals are a bit uneven, especially when seen up close, but when viewed from far away the bud doesn't look too bad. Now to get to work on the other two buds. To see all of the posts on this project, just click here for the complete list. It's been a great weekend for stitching, as we have had a late winter storm here in Southern California. It's been cold, wet and blustery, and we even had a bit of hail this morning. I realize that in a recent post I promised not to write about hearts for awhile, but the china cabinet reference pinged my memory. This is a cute hanging pillow of a heart that was a Wendy Schoen class several years ago and is now hanging on a china cabinet. I believe I took the class on some stitching retreat. It is worked on pale pink silk dupioni using DMC cotton floche. You can actually buy the kit from Wendy's website. We made the whole thing in class, so of course I once again did not fill it with lavender. It's really a fairly simple project. The embroidery consists mostly of bullion flowers with detached chain leaves. You can see how new I was to this embroidery as my backstitched grid is a bit wobbly. Here is a shot of the heart with the tassel. The tassel is made with DMC perlé cotton. In case you are really into this embroidered heart thing, as I seem to be, if you click on here on embroidered hearts or in the cloud label, the link will take you to all of my various heart projects. Now I really do promise, no more hearts for a while. I did manage to finish the Big Red Peony and take out the felt padding for the buds, but not much else. Thanks you to all of you who commented on it. I really appreciate the feedback, especially as I don't like to go against what a teacher tells me to do. And very especially as I paid good money for that advice! While the Peony looks OK, I think I could do much better by stitching first, couching gold later. We'll see how the buds turn out. Speaking of buds, here are the central detached petals. The one on the right is complete, and I'm filling in the center of the middle one. I really need to tape those wires down as the silk thread keeps catching on them. Click here to see all the posts on this project! This is why I didn't get much done, I was making a baby bib for a friend to give as a gift for a baby shower. Isn't he adorable? This is shadow work, which is just closed herringbone done on the back of the fabric. I've bunched the white fabric on the back to show you how the threads blur together to give the shadow effect. This is on white Imperial Batiste (polycotton) and I'll put a layer of white batting in between the embroidered piece and the back to make a kind of quilt. I'm using DMC thread so it can all go into the wash. I don't know about you, but this Daylight Savings Time has knocked me out and I'm going to bed. Sweet Dreams! Over that past few days as I've been working on the Persian Peony Tile I realized a made a fairly major mistake. Can you see it? look at the upper right hand portion of the uncovered felt. Notice that white flaky stuff? That's the fusible web used to iron on the pattern so I could cut out the felt. It's supposed to be on the bottom! I've been covering it fairly well, but have been picking out the really flaky bits with tweezers. But what's really been bothering me about this project is the order of work. The teacher, Jane Nicholas, had us apply the felt, then the gold outline, then embroider the peony. Every other set of instructions I've seen (admittedly not many) says to cover the felt first with the embroidery, then outline later. You can see in this photo that the needle coming up from the back is nudging the gold thread. In at least one place I've damaged the gold. So this is really starting to bother me. It's too late to change for the Big Red Peony, as I only have four more petals to finish, but I can change this with the Peony buds. You can see the felt padding for the two lower buds. The one on the far left is the only one applied with the fusible web down. It's hard to see in the photos, but in real like it's pretty flaky. Here is the top bud with the gold outline and the top petals outlined and filled. I think I'll take them all out and redo them, cutting out new pieces of felt, and embroidering them before I outline with gold. I hope that this will be much more precise, as I feel the Big Red Peony looks a bit uneven with its outlining. All five petals of the three buds need to be outlined in gold, but I think I have plenty to do the job properly. This particular kit has very generous amounts of materials which I really like. I think it's always better to pay a bit more for a kit to have extra materials than to come up short, don't you? Not being an expert in Goldwork, I'm a bit nervous about not following the instructions precisely. Do you ever deviate from the instructions, thinking you can do better? If so, how did it turn out? Click here to follow along the complete project! After the Starchy Experiment post I'm sure you now know that I'm a bit particular about ironing. Recently I made a new pad and cover for the ironing board but was very negligent about the photos, as I mentioned in the post about finishing up my little crewel work projects. So I'll explain what I did by illustrating the steps for redoing my ancient, double sided sleeve board. Notice how nice and fat it is? I like my ironing boards to be very well padded. Here is the pathetic thing, just some particle board with a thin batting and a cover that is coming apart around the edges. First of all, I traced around the edges on some prequilted ironing board fabric. Then cut around the markings a good inch away so the edges of the board are padded. This is particularly useful when ironing baby clothes. For the outside fabric I used drill, a heavy cotton fabric. Be sure to wash it first! It really shrinks a lot. I cut two pieces for each sleeve, and stitched the quilted piece to one piece of the drill. Then I place the sewn piece on the plain drill, sewed a 3/8 inch seam all around, leaving a turning opening at the fat end. After clipping the corners I turned it rightside out making a drill-quilt sandwich. After sewing all the way around close to the quilted fabric, I threaded cord through the opening and pulled. I cut some Home Dec fabric (on sale at Joann's) just a bit larger than the original drill pieces. And made a narrow hem, then a larger one, about 1/2 inch, leaving an opening in the fat end. Thread the cord through the hem, pull and secure with a cord stop. This gives me four separate tails, but I can live with that. I used a coordinating toile fabric on the other side. I'm missing a cord stop as you can see in the lower right of the photo, and hope to get to Joann's soon to remedy that situation. So I'm sure you're wondering, why go through all that trouble for a sleeve board, or a large ironing board for that matter? As I said earlier, I like my ironing boards well padded. But the real advantage is keeping it clean. Once the ironing board cover gets full of starch and sticky and dirty, it's easy to take it off and throw it in the wash. Then if I don't get around to the laundry, I still have a functioning ironing board cover, not as pretty, but it still works. With three of us working, we have quite a few shirts to iron each week. Although Hubby is retiring the end of April (isn't that exciting? ), so there won't be so much to iron. But there is another advantage to this method. Say you don't want to mess with the pretty cover and are willing to just use the drill sandwich as your ironing surface. This works very well, by the way. The drill sandwich is reversible! So when it gets all sticky and dirty, just take it off the board and flip it over. I use the elastic clips on the bottom to keep it taught so it's easy just to flip it. For my large board, I took apart the old pad and placed it under the drill sandwich. So it's really well padded. Now, I'm not too practiced on tutorials, so if you have any questions, comments, suggestions, please feel free to let me know what you think of this post. I actually used to write these for a living (well, they were test methods, but the idea is the same), but that was over 20 years ago. You know you're really aging when you can measure time in decades! I'm now working on the Big Red Peony of the Persian Tile Project. To start with, somehow my photos of the work in progress were inadvertently deleted. That must be the work of my evil twin, Cindy. I'll have to have strong words with her! When I last posted on this project, I had finished all of the leaves and stems. What a milestone that was! It felt so good to finish something, even though this is not a really huge project. So now I'm working the Really Big Red Peony in the center of the project. First of all, the instructions said to couch the No. 6 smooth passing gold thread around the outer petals. Okay, that was tedious and took over an hour, but not that difficult. What is odd is that now we are supposed to cover the felt padding with satin stitch using the silk thread. On almost every technique I've seen to date, and admittedly that hasn't been all that many, the order of work is quite a bit different. First, you add the felt to the ground fabric, so far so good, then couch the gold around the edges. Then, add the satin stitch with the silk thread by stitching inside the gold borders! I'm not sure I like this technique of laying down the border first, then adding the inside silk thread. But I'll work it as developed, then change the techniques down the road sometime. I got two of the outer petals stitched. I hope you have had a better weekend than mine! It's now Sunday evening, and as I've been up since 3 am (couldn't sleep), I'm ready to crash. If you would like to follow this project all the way to its fulfillment, just click here! I very much appreciate all of you who leave comments on my blog, whether to tell me my projects are lovely or to set me straight on some matter. I was especially intrigued by Jan's comment to my post on trying to find spray starch. She recommends using Mary Ellen's Best Press, which is billed as "The Clear Starch Alternative". I searched all over the internet trying to find out just what is in this stuff, but to no avail. I did, however, find a Material Safety Data Sheet (MSDS) which says it's not carcinogenic (thank Heaven! ), but don't ingest the stuff. Starch, of course, is perfectly safe to drink, but I wouldn't want to drink the products marketed for ironing. I decided conduct a quasi-scientific study to try to determine if BP is really so great, so I went out and bought some along with a can of aerosol spray starch. My experiment consisted of comparing these two against homemade spray starch using Kingsford's starch and the concentrated Staflo starch (on the left in the unmarked bottle made up in a four to one ratio). By the way, the spray starch formula is incorrect on the bottle. I use one Tablespoon per pint of water. I just washed sheets, so I had plenty of pillowcases to iron. Normally I iron these using my steam press iron, but decided to use the hand iron for this little study. I sprayed each pillowcase with once type of spray and immediately ironed them. I then laid them all out on the bed for comparison. First of all, I used the homemade formula. It sprayed on somewhat evenly, given that it is in a non aerosol bottle, and ironed well, with no flaking or sticking to the sole plate. It gave a flat, but not a real crisp finish. I put lavender essential oil in it, so it had a lovely smell, especially as I'm pretty heavy handed with it. Then I tried the Staflo mixture from concentrate. It worked just as well, with that same lovely lavender scent that I added. No flaking or sticking to the sole plate. The Faultless sprayed on very evenly, after all, that's the advantage of an aerosol, but it had a faintly annoying "linen fresh" scent. It also ironed well, with no flaking or sticking. Both of the commercial starches gave a nice, crisp finish to the pillowcases. Last of all came the BP. This was the cherry blossom scent and it is a heavenly smell! It also didn't stick or flake, but didn't iron as well. I had to keep ironing and ironing over the same area to get a flat surface, which never quite matched the starches, especially as it wasn't very crisp. After looking at all four pillowcases, I had to conclude that the commercial starches gave the best finish, ironing in well and making the fabric nice and crisp. Then I remembered that I had read somewhere that cooking the homemade starch makes it work a bit better, so I dumped the bottle into a pot and simmered it for a few minutes until it was almost completely translucent. After cooling I tried it on another pillowcase and the finish was indistinguishable from the two commercial starches. You may think it's odd that none of the starches flaked at all. My experiment was conducted with 100% Egyptian cotton pillowcases, which are very absorbent. I suspect that if I repeated this with shirts or quilting fabric I would get very different results. So now let's look at the cost. Cornstarch costs $12.99 for a 16 oz jar and contains 56 Tablespoons (according to the package). The Staflo was $21.20 for a 64 oz bottle of concentrate, making the equivalent of seven aerosol cans, the Faultless aerosol $2.99 for a 20 oz can, and the Best Press was a breathtaking $8.00 for a 16 oz bottle! However, after searching on Amazon I found you can buy a gallon refill for $29.70, reducing the cost to a much more reasonable $1.86 for 16 oz. The non aerosol Niagara that I also sometimes use, but didn't in this experiment, is available for $2.54 for a 22 oz bottle. And what about availability? I had to go to a quilt shop to buy the BP at that unbelievable price, but can get it on Amazon. Jan buys hers at Hancock Fabrics, but there aren't any here in my neck of the woods. The Staflo concentrate is also (supposedly) on Amazon, but when I tried to order it they couldn't seem to find it so I cancelled the order after finding it at Walmart. There is another brand called Linit available on Amazon, but I haven't tried it. Maybe next time. Both the Niagara and Faultless are available at supermarkets and Joann's fabrics. Other considerations: Using the Kingsford's means one less product you have to buy and keep on hand, but it is a bit more trouble to make up and cook. The Faultless aerosol and the Niagara non aerosol are the easiest to find and use, but not too environmentally friendly as each can or bottle gets thrown away. I'm not too keen about aerosols as I really don't need the hydrocarbons from the propellant in the air. The Staflo and the Best Press are much harder to find, but available. What's nice about the Staflo and the Homemade is that I can adjust the strength to whatever I need instead of having to spray several times. This is handy for ironing fabrics for quilting, but it's not essential. But what really annoys me about the Staflo is that it is priced so there is not much savings over the individual cans or bottles. I would expect to see a much greater savings by using a concentrated product. So I'll probably use up the two bottles of Staflo that I have on hand then switch to the Homemade. I have the rest of the BP to use, so maybe I'll grow to like it. I certainly love the fragrance. Long before I started this blog, I began work on Wendy Schoen’s Waterfall Christening Gown. I have now finished all of the embroidery on the dress and bonnet and now am beginning the construction. To give this gown a truly heirloom look, I’ve decided to construct it all by hand, and will document the process as much as possible on this blog. I’ll be using the techniques found in Sarah Howard Stone’s Book French Hand Sewing with a few exceptions that I will bring up as the construction progresses. You may wonder why I would make a gown completely by hand when there are relatively easy ways and plenty of resources to help us mimic French hand sewing techniques by machine. If you love hand embroidery, as most of you do or you wouldn’t be reading this, you will likely love and appreciate hand sewing. It’s incredibly satisfying to make a garment completely by hand, to know that you can do it, and to do it well. This first photo above is a partial shot all the work completed to date on the front of the skirt. The back of the skirt also has dotted Swiss fabric attached to the batiste using point de Paris, or pin stitch, that follows the curve of the template in the pattern, but only along the hem. This is one of the the back yoke pieces that are the first to be worked. The facing at the center back is folded over and blind stitched. Then the bottom of the yoke is rolled and whipped before sewing on the entredeux. Now, rolling and whipping isn't easy! It takes a fair amount of practice, which I haven't had. I've only sewn a few garments with hand rolling and whipping, so my edges are a bit uneven, but it doesn't look too bad. I'll try to remember to get some closeups for you to see next time. Sewing on the entredeux is simple, all you have to do is trim one edge of the fabric strip as I've done in the top of the photo, then whip stitch the rolled edge of the yoke to the square holes in the entredeux. The other side of the entredeux will then be used to attach the skirt to the yoke pieces. The two back yokes with the entredeux sewn on, ready for the skirt back. Now it's time for the buttonholes! I really need practice on those. The front yoke has all the embroidery finished and the entredeux attached. Here is my first instance of cheating. I debated on how to gather the skirts for attaching to the yoke. I could have hand sewed a running stitch using a strong thread to gather, run the fabric through a pleater, or run gathering threads on the machine. In the end I decided to use the machine. I’ve had a difficult time in the past gathering by hand so didn’t want to deal with a lot of uneven gathers. A pleater makes beautiful gathers, but on this lightweight fabric the gathers are very pronounced; the pleater is much better suited to heavier fabrics for this purpose. I went with the third choice, the sewing machine, using a polyester thread with a stitch length of 3.5 and ran two rows of stitching, lining up the edge of the presser foot with the edge of the fabric for the first row, then with the first row of stitching for the second row. The polyester thread is so strong that it pulled beautifully and didn’t break. Once the gown is finished no one will ever know - except all of you. The next step is to stitch the gathered skirt pieces to the yokes. The traditional way is to roll and whip the top of the flat skirt, pulling on the thread to gather it. The gathered skirt is then stitched to the entredeux by whipping it through the holes in the entredeux. This technique takes a fair amount of time to master and unfortunately, I haven’t mastered it. I can roll and whip a flat edge with a slight degree of skill as mentioned above, but not gather it as well. So I will attach the gathered skirts to the entredeux using a running stitch, trim the gathered seam allowance, then fold the fabric of the entredeux over the gathers and stitch down with another running stitch. But that’s for the next post. This dress is made with Bearrissima cotton batiste and cotton Dotted Swiss. The Bearrissima fabric is $26.00/yard, but at least it's 55 inches wide. It is absolutely the most heavenly fabric to work with. A firm finger press holds the fabric in place for all sewing. No trips to the iron are needed. I have to say, I really love sewing this dress by hand. It is such a peaceful and contemplative process that yields lovely results. I hope that this series of articles will inspire you to try your hand at some heirloom hand sewing. If you would like to see the (one) previous post, just click here to follow along.